Unwind and unwrap with our foil-pack shrimp. 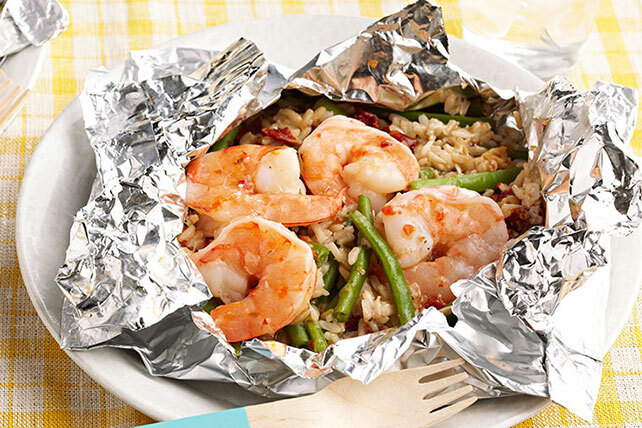 Shrimp, green beans, rice and sun-dried tomatoes are bundled and grilled in these Foil Pack Shrimp Bundles. Place beans in large microwaveable bowl. Add water. Microwave on HIGH 5 min., stirring after 3 min. ; drain. Return beans to bowl. Add rice, cheese and tomatoes; mix lightly. Whisk dressing, lemon zest, juice and mustard until blended. Reserve 2 Tbsp. dressing mixture. Add remaining to bean mixture; mix lightly. Spoon onto 6 large sheets heavy-duty foil with sides slightly rolled up; top with shrimp and reserved dressing. Fold foil to make 6 packets. Grill 10 to 12 min. or until shrimp turn pink and rice mixture is heated through. Cut slits in foil to release steam before opening packets. Use cooked brown rice purchased from your favorite Asian restaurant to prepare these easy-to-make grilled bundles. Sprinkle ingredients in opened packets with chopped fresh dill before serving.